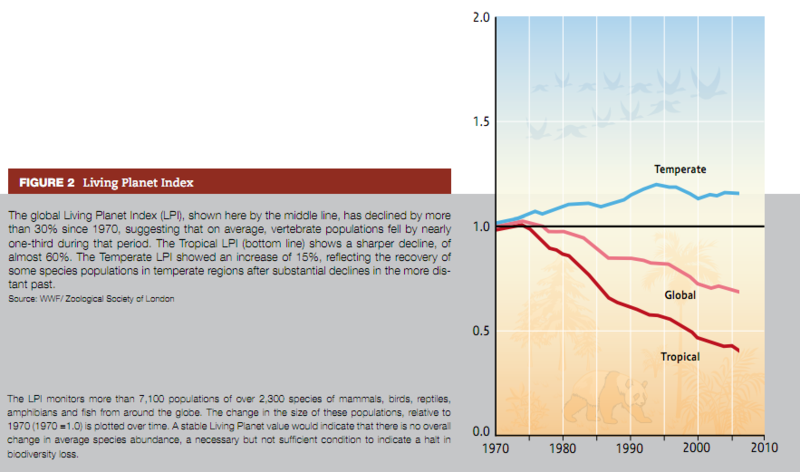 The global Living Planet Index (LPI), shown here by the middle line, has declined by more than 30% since 1970, suggesting that on average, vertebrate populations fell by nearly one-third during that period. The Tropical LPI (bottom line) shows a sharper decline, of almost 60%. The Temperate LPI showed an increase of 15%, reflecting the recovery of some species populations in temperate regions after substantial declines in the more distant past. Temperate species populations actually increased on average since 1970, and the steady global decline since that date is accounted for entirely by a sharp fall in the tropics. This does not necessarily mean tropical biodiversity is in a worse state than in temperate regions: if the index were to extend back centuries rather than decades, populations of temperate species may have declined by an equal or greater amount. Moreover, the increase in wild animal populations in temperate regions may be linked to widespread afforestation of former cropland and pasture, and does not necessarily reflect richer diversity of species. However, the current rates of decline in global species abundance represent a severe and ongoing loss of biodiversity in tropical ecosystems. Farmland bird populations in Europe have declined by on average 50% since 1980. Bird populations in North American grasslands declined by nearly 40% between 1968 and 2003, showing a slight recovery over the past five years; those in North American drylands have declined by nearly 30% since the late 1960s. Of the 1,200 waterbird populations with known trends, 44% are in decline. 42% of all amphibian species and 40% of bird species are declining in population. The IUCN Red list categories reflect the likelihood that a species may become extinct if current conditions persist. The risk status of species is based on information generated from the work of thousands of species scientists from around the world. Assessments follow a rigorous system which classifies species into one of eight categories: Extinct, Extinct in the Wild, Critically Endangered, Endangered, Vulnerable, Near Threatened, Least Concern and Data Deficient. Those species that are classified as Critically Endangered, Endangered or Vulnerable are considered to be threatened. Species are assigned to categories of extinction risk using criteria with quantitative thresholds for population size and structure, rate of population decline, range size and structure, and extinction risk as determined by modeling of population viability. As of 2009, 47,677 species had been assessed and of these 36% are considered threatened with extinction; while of the 25,485 species in completely assessed groups (mammals, birds, amphibians, corals, freshwater crabs, cycads and conifers) 21% are considered threatened. 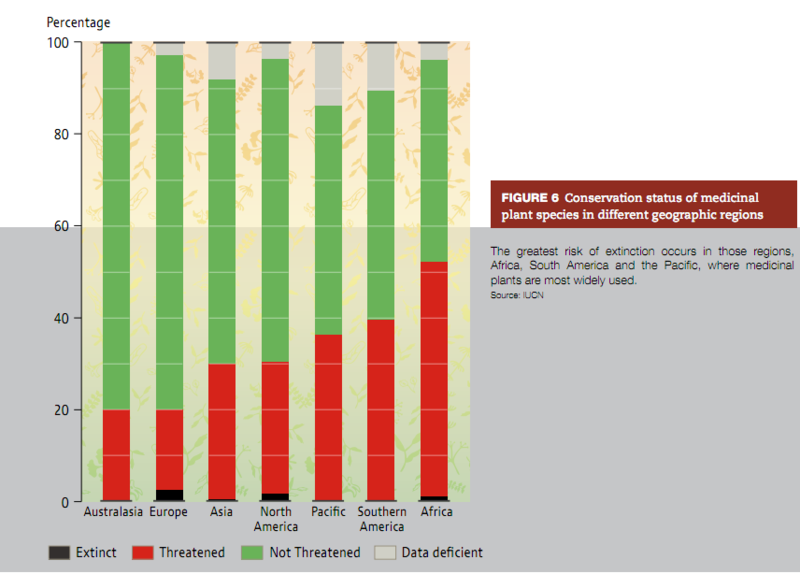 Of 12,055 plant species assessed, 70% are threatened. However, plant species with a higher average extinction risk are over-represented in this sample. 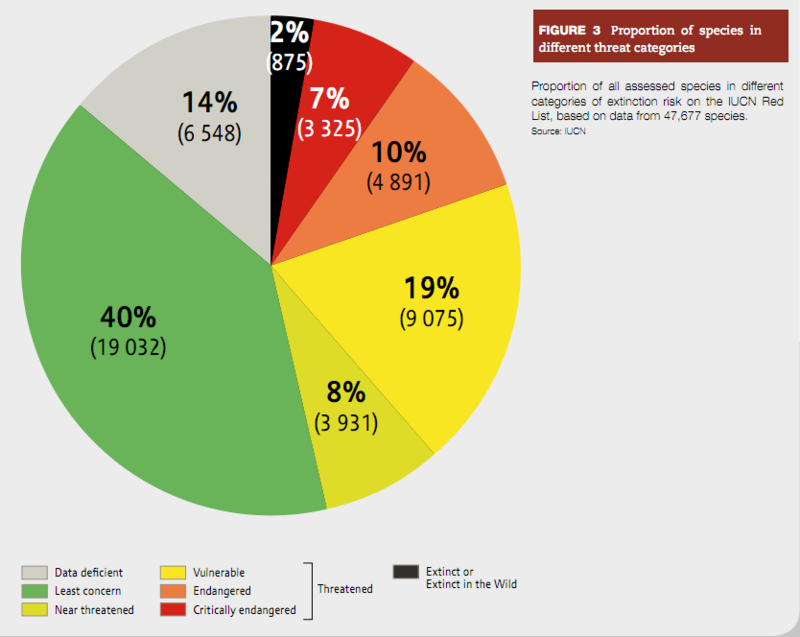 Proportion of all assessed species in different categories of extinction risk on the IUCN Red List, based on data from 47,677 species. The proportion of warm-water coral, bird, mammal and amphibian species expected to survive into the near future without additional conservation actions has declined over time. 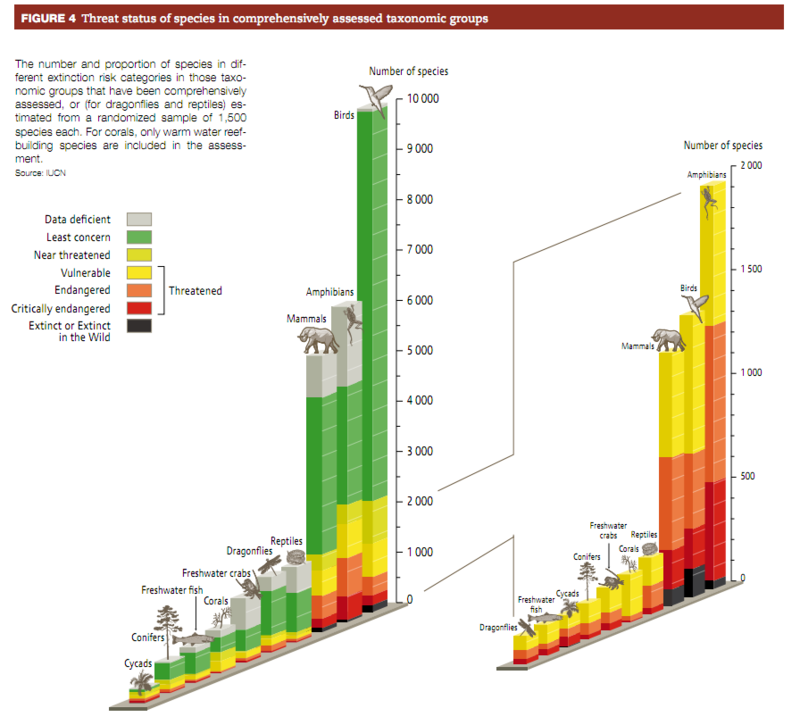 The Red List Index (RLI) for all these species groups is decreasing. Coral species are moving most rapidly towards greater extinction risk, while amphibians are, on average, the group most threatened. not expected to become extinct in the near future. At the other extreme, a value of 0 indicates that all species in a group have gone extinct. A constant level of the index over time implies that the extinction risk of species is constant, and if the rate of biodiversity loss were reducing, the lines on this figure would show an upward slope. Bird species have faced an especially steep increase in extinction risk in South-East Asia, on the Pacific Islands, polar regions and in marine and coastal ecosystems. Mammals have also suffered the steepest increase in risk of extinction in South and South-East Asia, due to the combined impact of hunting and loss of habitat. Between ecosystem types, marine mammals have faced the steepest increase in risk, although freshwater mammals remain the most threatened. Amphibians have deteriorated in status fastest, and are in absolute terms at greatest risk of extinction, in South and Central America and the Caribbean. The greatest risk of extinction occurs in those regions, Africa, South America and the Pacific, where medicinal plants are most widely used.